Spring came early this year in north Texas. Spring arriving early was a wonderful thing because my sister and brother surprised me with a spring garden party for my birthday. You are invited to join the party and to see how to use what you have to create a beautiful outdoor party. Katie at Let's Add Sprinkles is hosting the Hello, Spring Blog Tour, and my surprise birthday party came at a perfect time to share as part of the tour. 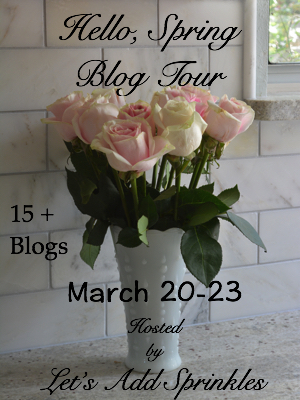 For new readers visiting as part of the Hello, Spring Blog Tour, welcome! I hope you will become a regular reader and come back often. Regular readers, dear friends, thanks for stopping by to see what's going on this spring at Botanic Bleu. I am excited to be joining 14 talented bloggers who are also sharing how spring looks in their homes. The full schedule is listed at the bottom. Be sure to visit them, and tell them the birthday girl said hello. 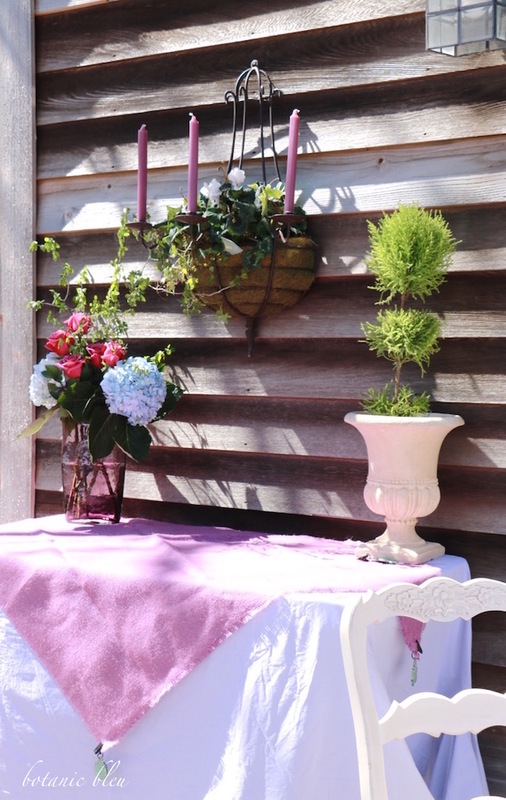 I had planned to share my French-inspired garden shed all decked out for spring, but will share it later. Plan an outdoor party during a time for the best weather in your area. Brilliant sunshine and blue, blue, blue skies made the outdoor party possible. The temperature was a little cool, and there was a snappy breeze when the party started, but with sweaters and light jackets guests were not too cold. The first daffodils on the hillside opened just in time for the party. I planted half of these daffodils years ago and the other half two years ago. This is the second spring for the latest ones to bloom. Whenever I think of spring and daffodils, my mind sees the field of dancing daffodils in Dr. Zhavigo. Maybe one day my hillside will be full of blowing daffodils. 🌠 If someone in your family is having a very special birthday, wedding, retirement... think ahead and plant shrubs, flowers, and trees that will be at their peak on the date of your planned party. Keep in mind plants follow Mother Nature, and their peak times can vary from year to year. Notice that some of the daffodils are blooming and some are not. 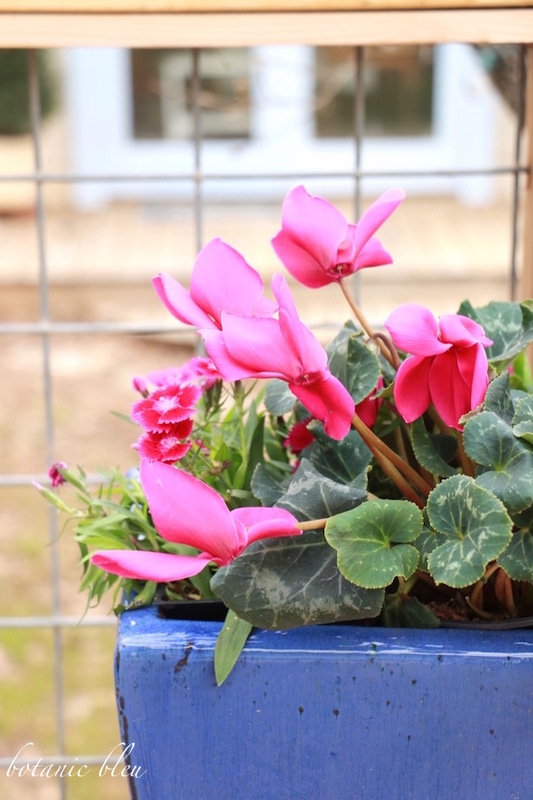 There are two varieties in this bed; one early blooming variety and one mid-blooming variety which stretches the bloom period over four weeks. 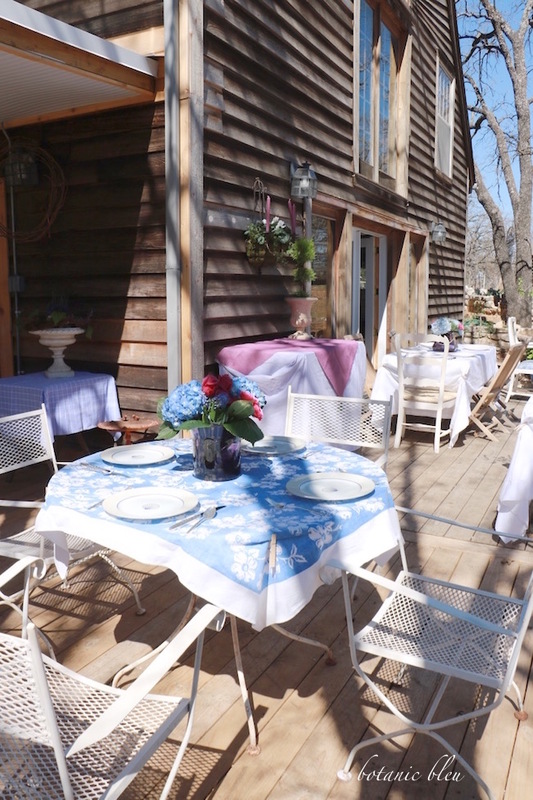 Four tables for guests and one table for serving drinks filled the new open deck. The boxwood shrubs I planted in the blue pots last year sprouted new growth this year, and it looks promising that I will be harvesting a few sprigs for Christmas decorations this year. 🌠 In your planning ahead, think about updating your outdoor areas by adding a new deck, new walkways, or lighting so they will be completed well in advance of the outdoor party. The last thing you want is added stress from a project not completed on time. These are the first photos shown for the deck's new open area. The wrought iron table and chairs are in the open section that was added late last summer. Here's how my sister used what we had to turn our deck into a spring garden party. The blue and white pillow normally sits in the white wooden armchair with the matching pattern on its seat cushion. For the party, the plump pillow turned the concrete bench into a comfy dining place. 🌠 Move indoor furniture, chairs, and pillows to the deck. Use deck furniture, and place the other furniture to maximize deck furnishings. Two pillows could have been added to this bench to provide two seats, but only one was needed for the party. Indoor and outdoor chairs were rounded up. One table was placed near the outdoor bench so the bench could be used for seating. Brick pavers raised the bench to a more comfortable height for dining. Large European-sized blue checked pillows from a guest bedroom did double duty. First, they made the bench more comfortable. Secondly, they brought the diners closer to the table. 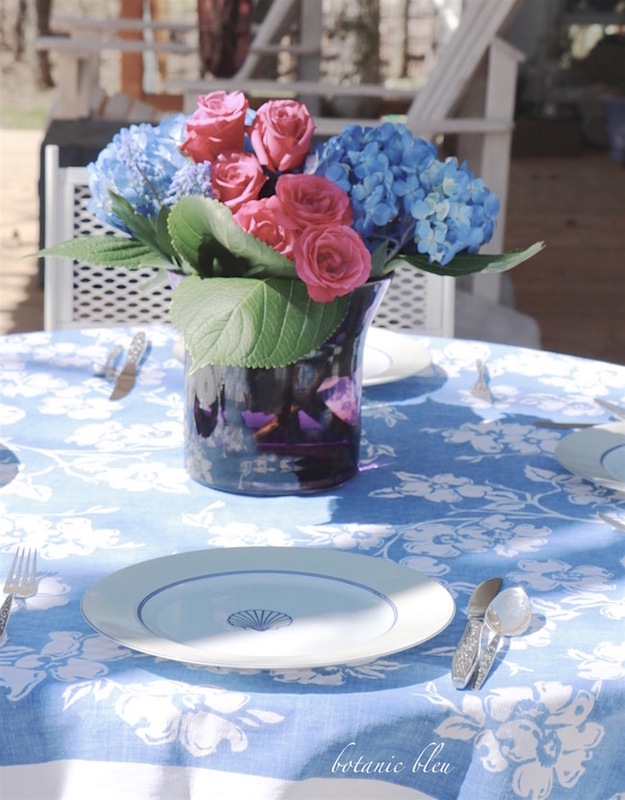 Each table had a different tablecloth, napkins, plates, and floral centerpiece. Clothespins clipped the cloths to the tables to keep the wind from blowing them away. We do not have enough plates or silverware in the same pattern for the number of guests. This table had four plates with a blue shell. The silverware is my wedding silver pattern that has flowers engraved on the handles. 🌠 Mix and match serving pieces, dinnerware, linens, and centerpieces. A color scheme can unify all of the different designs. 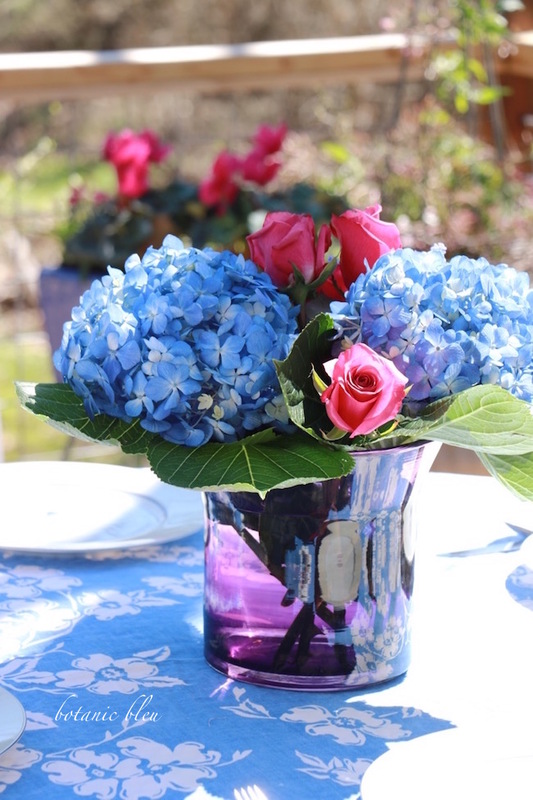 Blue and white, with magenta, was the color scheme for this spring garden party. 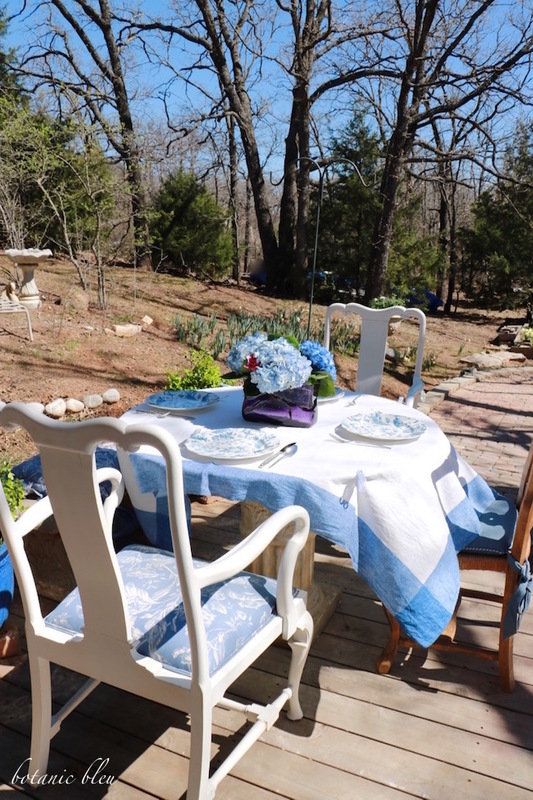 A vintage blue and white dogwood pattern tablecloth fits the round wrought iron table. The tables were in the process of being set when these photos were taken. Napkins, menu cards, and place cards were added after these photos. The round table at the other end of the deck had a vintage white with blue border tablecloth, Botanic Blue plates, and my wedding silverware. More clothespins to defeat the wind. March lived up to its reputation and came in like a lion. 🌠 Be prepared for weather surprises. Clothespins handled the breezes at our party. Large outdoor umbrellas or a tent can provide needed shade when the temperatures climb. Large drop clothes attached between the house exterior walls and nearby large trees are inexpensive shade cloths. Of course, there is always the chance of a downpour which means moving indoors. The two rectangular tables had different white tablecloths, but the same white scalloped edge plates. Each table had different napkins with the menu inserted into the folds. My brother lives in Alabama and was not able to travel to the party. However, he sent all of the invitations electronically, received the RSVPs, and created both the menus and place cards. He loves hosting parties. For years, he planned the menus and bought the food for monthly church gatherings at our mother's house. One time when Mother was in Texas visiting me, he and his wife still had the church party at mother's house.... without telling her beforehand. All of the party-goers laughed with my brother and mother about that. Mother didn't care. She loved parties, too. 🌠 Enlist others to help with the party preparations, even if they do not live nearby. Like my brother, others can help and by doing so, become a part of the party and the celebration. He was not able to attend, but several of my friends commented on his role in sending the invitations and accepting their RSVPs. They loved getting to know another member of my family. Now, as a family, we have another shared memory of a special party. A variety of crackers for the appetizers were served in different containers on the tables. Pitchers as well as bowls served crackers. 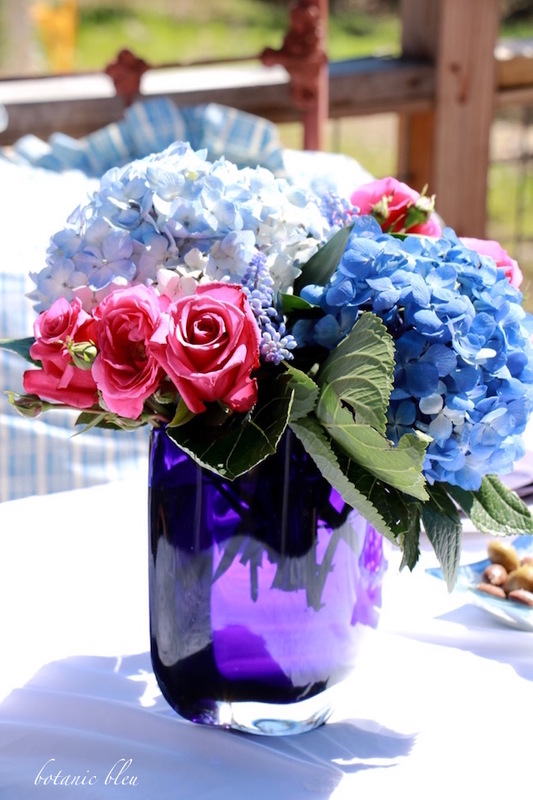 The flower centerpieces were blue hydrangeas and rosy roses. The flower vases were all different, but were either purple or blue. Of course, the flowers were spectacular since my sister arranged them. She is a professional florist. Between my sister and me, we have several purple and blue vases. This is a vase I gave my sister for her birthday one year. Flowers all around the deck were also in shades of magenta, white, and purple. My sister spent several days before the party filling all of the deck planters with beautiful plants. Since she loves flowers and loves working with them, I was not suspicious she was sprucing up our deck for spring. 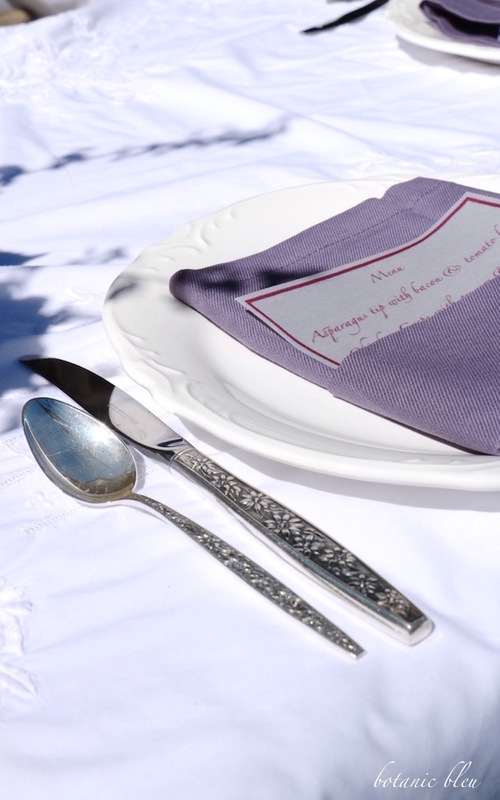 A lavender king-sized sheet and a magenta burlap square covered the drink table. 🌠 Bed linens are much bigger than most tablecloths which makes them ideal for large and/or high tables. The lavender sheet was long enough to go to the deck on all three visible sides and to hide its metal legs A N D the water faucet behind it. A white flat sheet was placed on each of the long rectangular tables normally used for construction tasks or for home projects. The tables' surfaces were cleaned, but the sheets were used to protect the white tablecloths from any possible remaining stains on the tables. 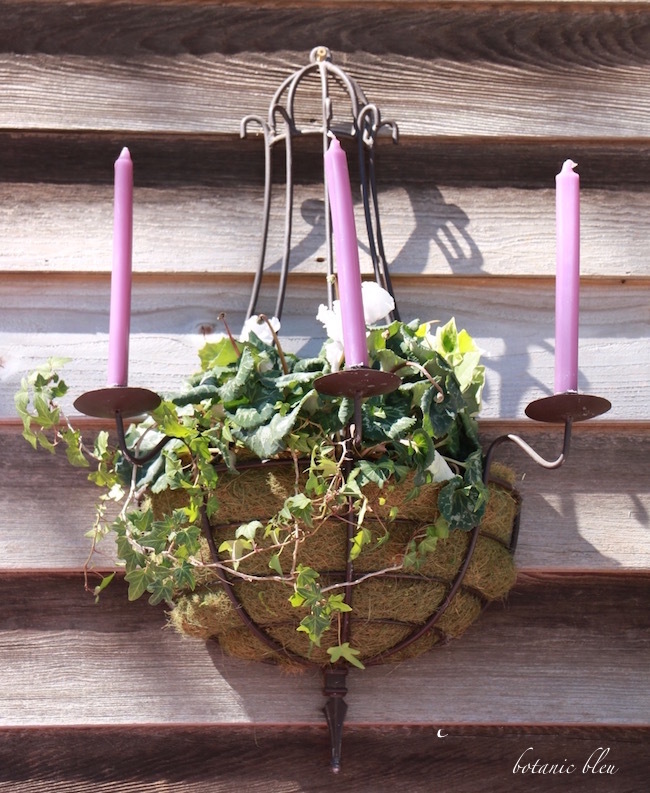 The black wrought iron candelabra had white cyclamen, ivy, and purple candles. All of us loved this arrangement. 🌠 Create one extraordinary focal point. All of the table settings and flowers were beautiful, but this candelabra was unique and drew everyone's attention to the drink table. Everyone who came brought a birthday card with a special memory written inside. Now I get to share my spring garden party with all of my virtual friends around the world. for making this a special birthday. Did you get some ideas for creating your own spring garden party? And, remember to tell them the birthday girl said hello. 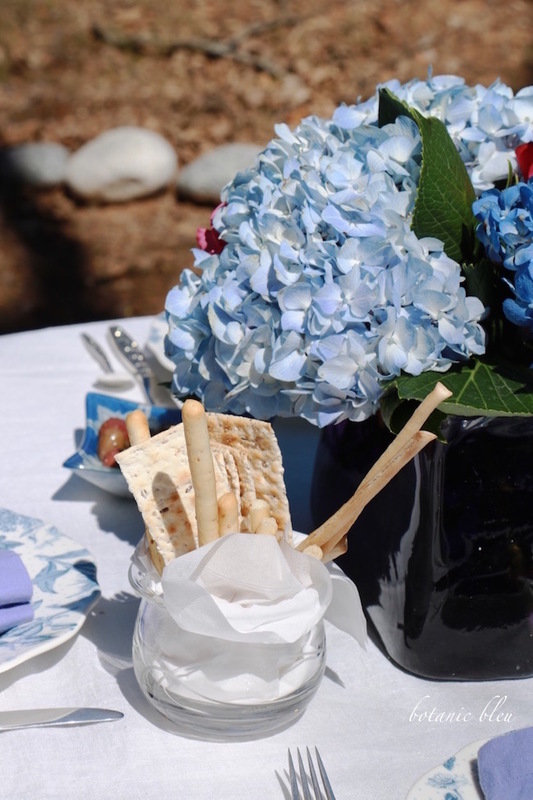 Love the blue and white with pops of pink - what a beautiful garden party! 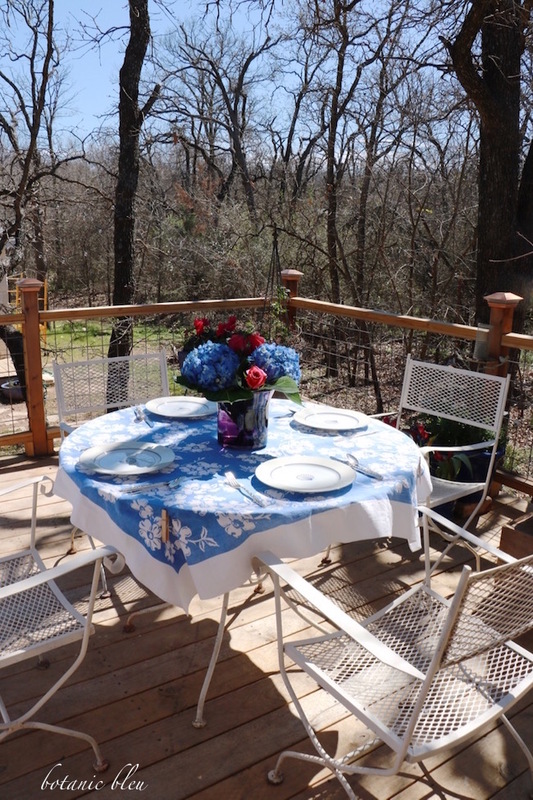 Your new deck is just perfect for festivities. Everything is gorgeous, especially the hydrangeas. Now I want to throw and outdoor party. I too sadly will not be attending Jemma's event. We have a house guest arriving and will be leaving for Round Top. Hope to see you soon. Oh my, Happy Belated Birthday. What a special party! The decor is lovely. I agree, the arrangement in the candelabra is stunning. Thanks for being a stop on our blog tour. Hello, Spring! Judith, What a lovely surprise party for you. 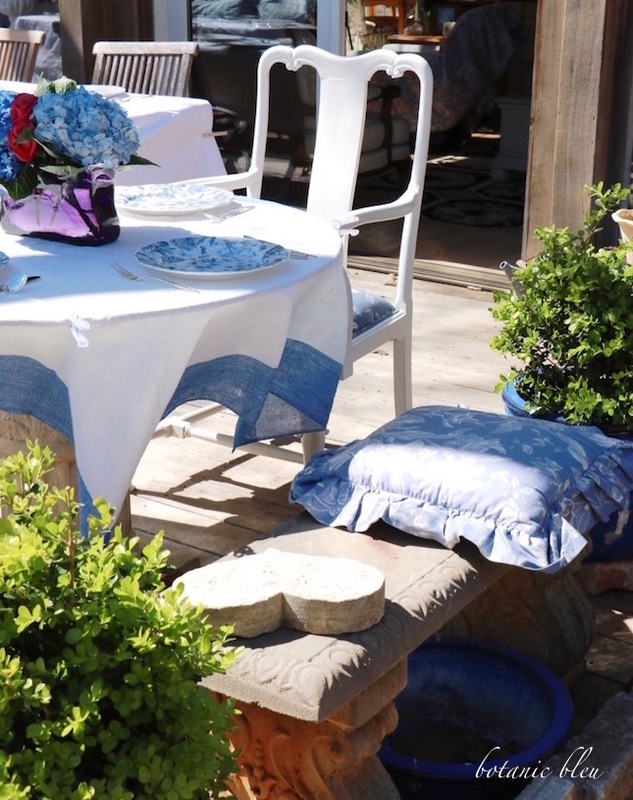 The tablecloths, flowers and pillows brought such a festive and pretty atmosphere to your deck. I love all the tables but the dogwood cloth has to be my favorite! The planters filled with boxwood and the candelabra planter add that special touch. Your colors are my favorites, too. You have a sweet sister. I want to throw a garden party now. Thanks for all the tips. I think that garden parties are my favorite. Happy belated Birthday! Such a fabulous setting for a party too. I love the combination of the roses and hydrangeas. So pretty. Judith, this looks like you had a very special birthday indeed. I think it's so neat that your family worked together to make this happen. The tables and all the accessories are beautiful! Your guidance with planting things that bloom at different times is so good! I need to work harder at that and plan to do so at our new house. I hope you had a wonderful birthday friend! Judith, a belated Happy Birthday! 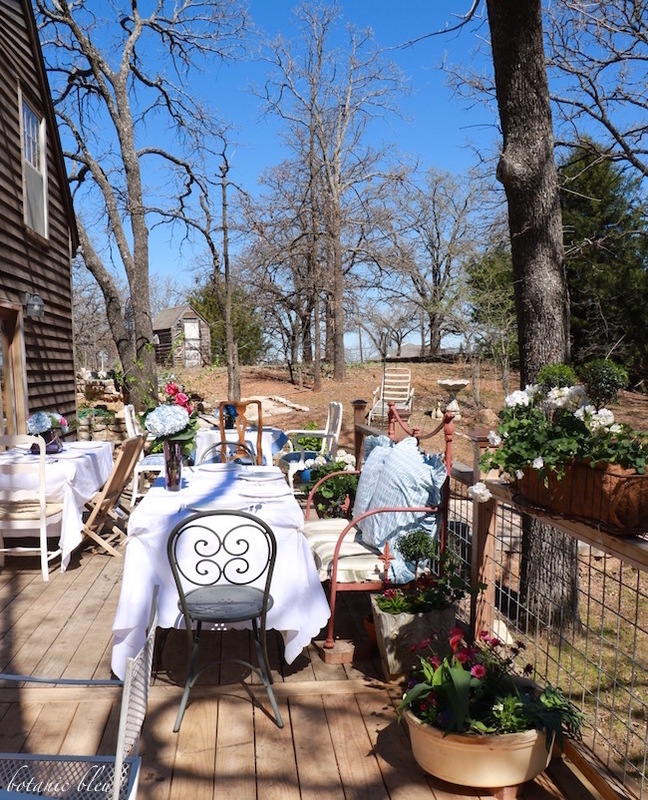 Your outdoor garden party is the perfect way to celebrate and entertain here in TX this time of year. We are so fortunate with our spring weather. We practically live outside or on the screened porch in spring. The temps are perfect, the birds are cooing and singing, and everything is sprouting out in fresh shades of green. Thanks for sharing the party details. Happy Spring! 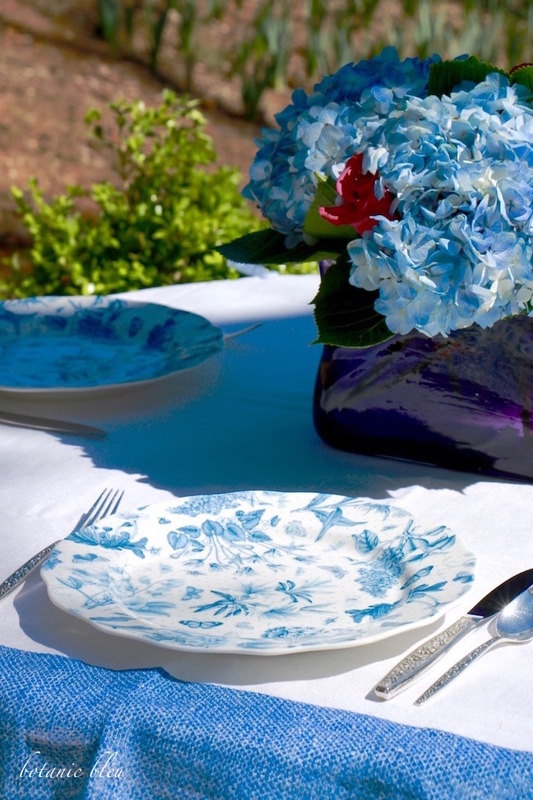 Great use of blue and white for your tablescape. Wish I could come to a party in your garden oasis. OMG! Your outdoor party is set so beautifully! I love the mix of fresh flowers and the pretty linens used. The mix of indoor and outdoor furniture makes it look even better! You gave me some good ideas on how to entertain outdoors for a large group. First, happy belated birthday wishes! 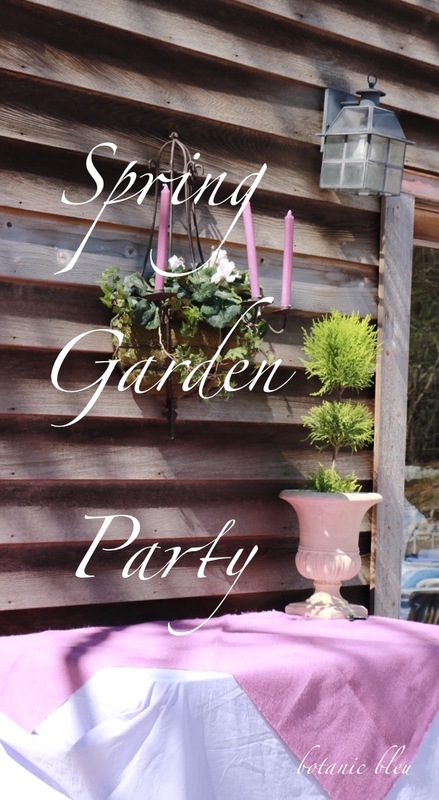 What a wonderful way to celebrate spring and your birthday with an outdoor garden party! A hillside of blooming daffodils sounds divine so keep planting! Enjoyed being on the tour with you! 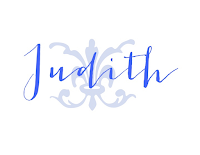 Judith, wow, just wow! Having just come from co-hosting the bridal shower for my niece, I realize just how much detail you've put into this garden party. The help received certainly lessens the stress in pulling off such a beautiful fete (it truly is gorgeous! ), but the unknowns - such as weather - I'm sure had you chomping at the bit the week leading up to. Kudos to you and your family members for what proved to be a memorable even, I'm sure, for all the guests. What a beautiful day and perfect setting to celebrate your birthday! I'm sure your day was special, Judith. We all love you so. What wonderful siblings you have! You must feel LOVED! Simple beauty was created in clever ways and it worked beautifully! What a beautiful party!! 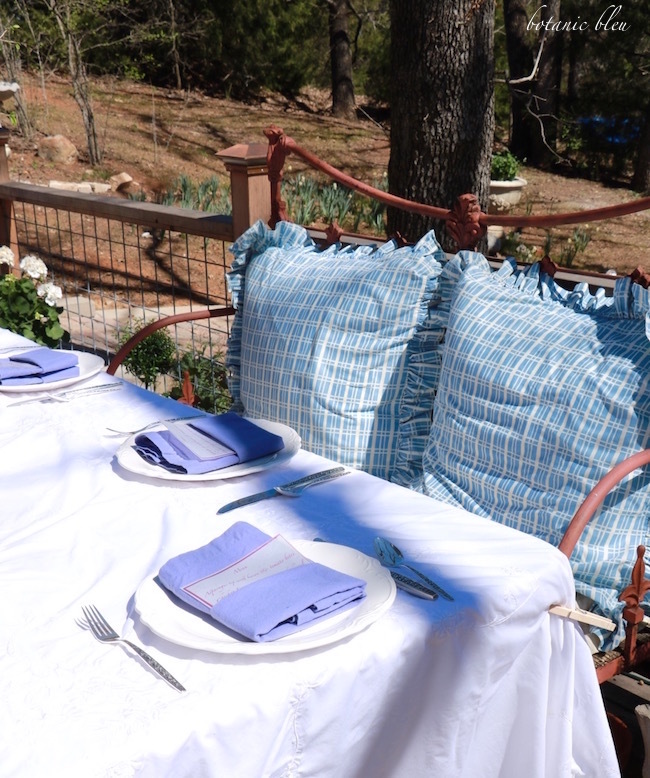 I just love the blue hyfangea's and all of blue linens used. Great tips too! 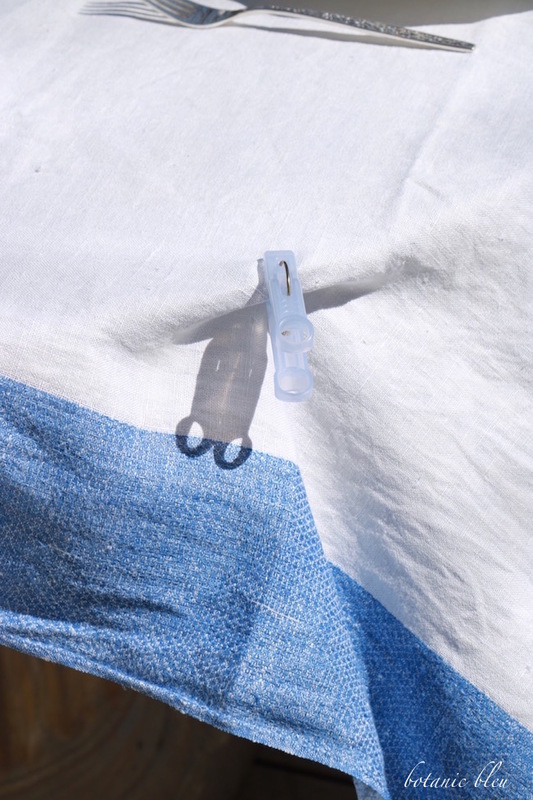 I never thought using clothespins to keep linens in plce. I need to remember that. I also really liked the cups with the artisan breads in them! They look great and I'm sure they were yummy for the guests. You had me at blue & white! 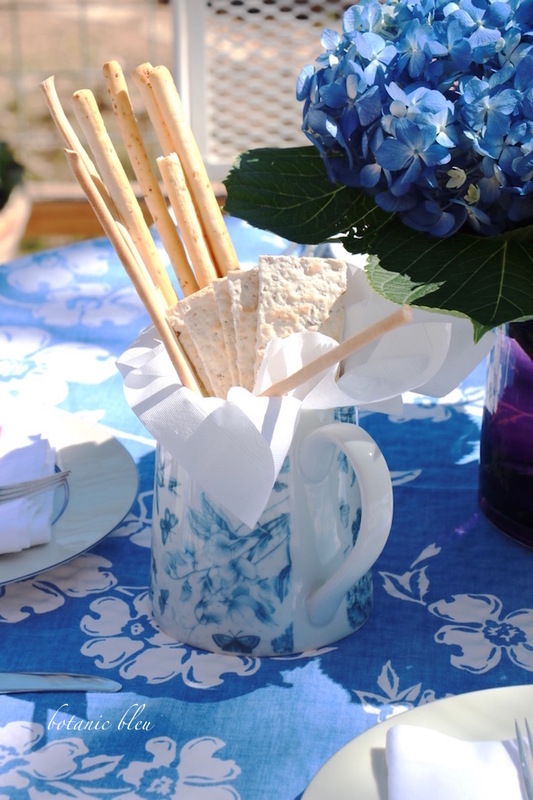 The blue and white floral tablecloth reminds me of my mothers blue and white tea set. My sister was quicker than me and got it for her house. 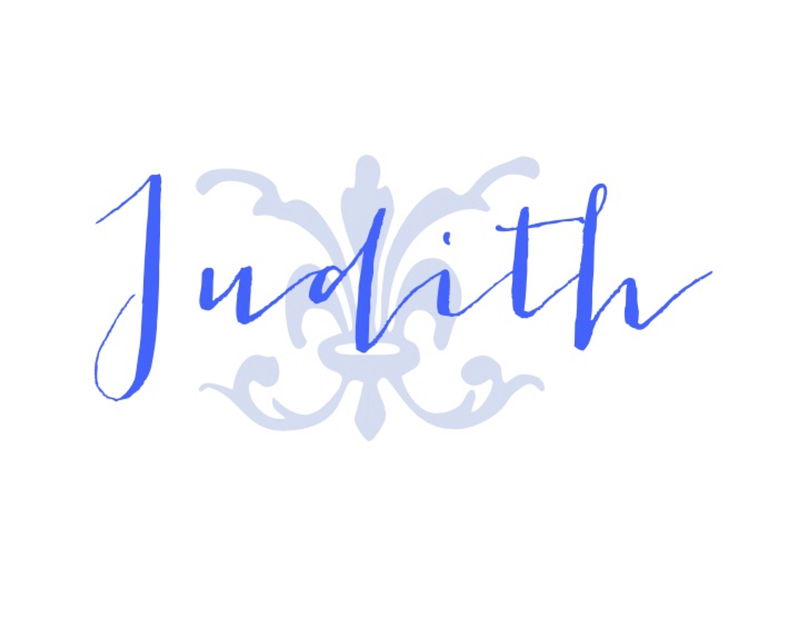 Belated birthday wishes, Judith! I know it was a special just from reading this post. Love the concept of using what you have. 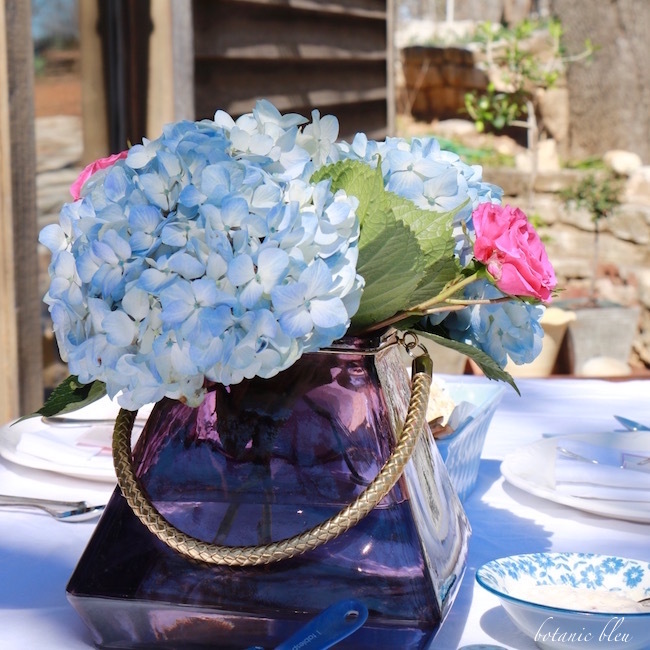 Each table has it's own personality paired with linens and vases that are special to you. The setting is perfection. Even the weather cooperated that day! So many talented, loving people contributed to making your day special. Once again, happy birthday and wishing you all the best in the upcoming year. 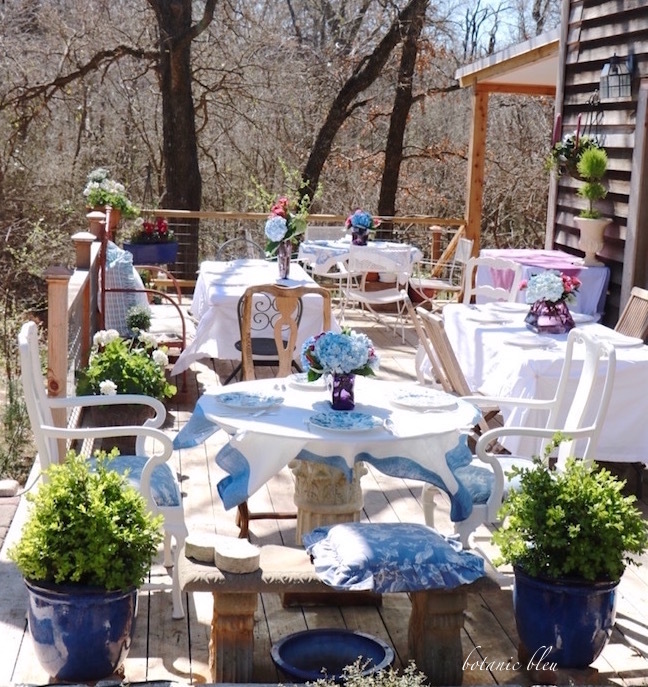 Your deck party was styled beautifully! I loved the mix and match theme and all the pretty French Countryesque details. Today your post was featured on my features for Thursday Favorite Things. Just a note about the link party- Our scheduled time for going live is now at 7 a.m MST instead of Wednesday evenings. Thank you for sharing with us. Your post is Pinned in our Thursday Favorite Things group board.